Looking to entertain your friends, family, community or school for movie night? We have the perfect solution for your event! Charlotte Party Rentals outdoor movie theater system is your solution. It will sure bring smiles and joy to all your guests. This large screen's viewing area is: 16′ Wide x 9′ High Total inflatable Size: 20′ Wide x 15′ High x 12′ Deep. 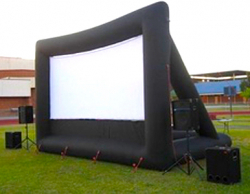 This movie screen rentals include: inflatable screen, speakers, projector, DVD player.